Russophile Fiennes, who also plays Nureyev's mentor Alexander Pushkin (in Russian) in The White Crow, became fascinated by the dancer's drive and dynamism almost twenty years ago when he first read Julie Kavanagh's Rudolf Nureyev: The Life, a book whose cinematic potential immediately captured his imagination. When he finally came to direct the film, his renowned attention to detail was valued by all his collaborators, including contemporary British composer Eshkeri, who is best known for his soundtracks to The Young Victoria and Still Alice. He created the music for Coriolanus, Ralph Fiennes's directorial debut as film-maker, and for the actor-director's critically acclaimed second film, The Invisible Woman, and here too worked closely with Fiennes in writing a score that expresses the complex and conflicting emotions involved in Nureyev's story. 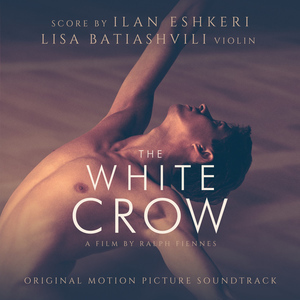 Deutsche Grammophon artist Lisa Batiashvili plays a prominent off-screen role as soloist in the score to The White Crow. The Georgian-born German violinist, raised under the Soviet system during its final years before moving with her family from war-torn Tbilisi to Munich in 1991, plays the beautiful melody of the "White Crow", which begins as the Entr'acte from Tchaikovsky's Sleeping Beauty, an intimate solo for the Prince brought back into fashion by Nureyev, and is then transformed into a full-scale piece by Eshkeri that conveys the catharsis and freedom of the dancer's defection. Batiashvili also performs all the other key melodies in Eshkeri's score. Her discography for the Yellow Label already includes majestic readings of the Brahms Violin Concerto with the Staatskapelle Dresden and Christian Thielemann, and of Prokofiev's Violin Concertos Nos.1 & 2 with the Chamber Orchestra of Europe and Yannick Nézet-Séguin. Her recording of the violin concertos of Tchaikovsky and Sibelius, made in partnership with Daniel Barenboim, was described by BBC Music Magazine simply as "Two greats, performed by two greats". She was named Instrumentalist of the Year in 2015 by Musical America. After an acclaimed 2017-18 residency with the Accademia Nazionale di Santa Cecilia, and having previously been Artist in Residence with the New York Philharmonic Orchestra and the Royal Concertgebouw Orchestra, Batiashvili is currently enjoying a varied year as Artist in Residence with the Münchner Konzertdirektion Hörtnagel. This summer is her first as Artistic Director of Audi Sommerkonzerte, Ingolstadt. "I think [Nureyev] was highly individual," said Ralph Fiennes before a screening of The White Crow at last October's London Film Festival. "He had a real sense of how things can be pushed further, a true artistic spirit, which is to break down or question the received wisdom or the received opinion, to challenge. But also he was trained in a very precise ballet tradition, the [Russian] imperial ballet tradition that the Soviet regime had co-opted for itself. He was a ferocious and difficult, contradictory man, who provokes different responses in people, but I love that. For me, he's a character rich in his fire to realise himself."